Quality, Safety and Informatics, Research Group, Division of Population Health Sciences, University of Dundee, Dundee. Background Computer templates for review of single long-term conditions are commonly used to record care processes, but they may inhibit communication and prevent patients from discussing their wider concerns. Aim To evaluate the effect on patient-centredness of a novel computer template used in multimorbidity reviews. Design and setting A qualitative process evaluation of a randomised controlled trial in 33 GP practices in England and Scotland examining the implementation of a patient-centred complex intervention intended to improve management of multimorbidity. A purpose-designed computer template combining long-term condition reviews was used to support the patient-centred intervention. Method Twenty-eight reviews using the intervention computer template and nine usual-care reviews were observed and recorded. Sixteen patient interviews, four patient focus groups, and 23 clinician interviews were also conducted in eight of the 12 intervention practices. Transcripts were thematically analysed based on predefined core components of patient-centredness and template use. Results Disrupted communication was more evident in intervention reviews because the template was unfamiliar, but the first template question about patients’ important health issues successfully elicited wide-ranging health concerns. Patients welcomed the more holistic, comprehensive reviews, and some unmet healthcare needs were identified. Most clinicians valued identifying patients’ agendas, but some felt it diverted attention from care of long-term conditions. Goal-setting was GP-led rather than collaborative. Conclusion Including patient-centred questions in long-term condition review templates appears to improve patients’ perceptions about the patient-centredness of reviews, despite template demands on a clinician’s attention. Adding an initial question in standardised reviews about the patient’s main concerns should be considered. Definitions of patient-centred care vary.1,2 Core components include an integrated holistic approach to the patient as a person, exploring and understanding the patient’s individual illness experience and concerns, achieving consensus on the health problem and its management, and enhancing the continuing relationship between patient and clinician. The broad aim is to achieve both patient involvement in care and the individualisation of care.3 Patient-centred care is encouraged for ethical and for pragmatic reasons, such as improved patient satisfaction and treatment adherence.4,5 As well as good empathy and communication skills, a patient-centred approach clearly requires a supportive environment,5 such as continuity of care. Electronic disease templates are commonly used in many healthcare systems, including in the UK, to structure chronic disease management and data recording. In the UK, specially trained nurses usually conduct focused long-term condition (LTC) reviews using electronic templates, often discussing lifestyle issues and sometimes instigating changes to disease management. If patients wish to discuss other issues they need to make a separate GP appointment, with little opportunity for their health to be reviewed in the round. This article focuses on the use of a novel, purpose-designed template that supported patient-centred reviews of patients with multimorbidity participating in a multicentre cluster-randomised trial (the 3D Study)16 evaluating the effectiveness of a patient-centred approach to managing multimorbidity in GP practices. The aim of the article is to report an aspect of the process evaluation describing use of the novel template and whether, and how, it appears to influence patient-centredness. Use of computer templates can compromise communication and patient-centredness by overriding patient agendas. This research finds that a new computer template, designed to encourage a patient-centred approach in long-term condition reviews, can enhance patient-centredness. Asking patients specifically about all of their health concerns at the start of a review can add value to the review. Patients feel they are viewed as a whole person and clinicians may identify unmet health needs. The 3D Study (3D stands for Dimensions of health, Drugs, and Depression, which were all targeted by the intervention to improve patients’ quality of life) recruited 33 GP practices and took place in three areas of England and Scotland.16,17 The patient-centred approach, defined with reference to well-known definitions,1,2,16 was incorporated in multiple intervention components, including comprehensive holistic two-part 3D reviews supported by the novel template and continuity of care (Figure 1). Three important aspects of patient-centredness were embedded in the 3D review template (Box 1), and the fourth was addressed by asking the practice to ensure continuity of care in arranging 3D patients’ appointments. Screenshots of the 3D review template are available from the authors on request. Flowchart of the 3D intervention. LTC = long-term condition. QOF = Quality and Outcomes Framework. The process evaluation of the 3D Study aimed to better understand how and why the intervention was effective or ineffective, and to identify contextually relevant strategies for successful implementation as well as practical difficulties in adoption, delivery, and maintenance to inform wider implementation. The full protocol is reported elsewhere.17 Case study methodology was used incorporating multiple methods to investigate the many aspects and stages of implementation in four case study intervention practices, supplemented by additional data from other participating practices to investigate emerging issues. During the process evaluation, the central role of the 3D template in clinicians’ delivery of the intervention became apparent and prompted this investigation. Data were drawn from recordings of reviews, interviews, and focus groups, conducted for the overall process evaluation in a sample of 12 of the 33 practices participating in the 3D Study: eight intervention practices and four usual-care practices. Four of the eight intervention practices were the process evaluation case studies, purposively sampled from 16 intervention practices to include each of the three geographical areas, and vary in size, deprivation index, similarity of usual care to the 3D intervention, and intervention set-up.17 In these case studies, it became apparent that 3D review delivery would vary by clinician more than by practice. Therefore, four additional intervention practices were sampled to extend the opportunity to observe variation among clinicians. One practice was purposefully chosen as the only practice where a research nurse was delivering reviews. Three were convenience sampled from the other two geographical sites in the trial because there was insufficient information to purposefully sample for clinician variation. Four usual-care practices were also convenience sampled, including at least one from each geographical site in the trial, to identify specific differences between 3D reviews and usual-care LTC reviews. Within the eight intervention practices, 3D patients were purposively sampled for review observation and recording according to which clinician they were seeing, to maximise the number of different clinicians observed and achieve a range of nurse and GP reviews. Within the four usual-care practices, 3D patients were convenience sampled because of the difficulty of identifying observable reviews. First, naturalistic data from observations and review recordings were used to evaluate enactment of patient-centredness verbally and through body language, and to assess template use.18 A researcher identified possible observations, using the sampling criteria mentioned before, from lists of upcoming reviews sent by the practice. Selected patients received an invitation letter and information sheet, and were telephoned a few days later to discuss participation and obtain verbal consent. Once patients had agreed, the consulting clinician was asked for consent by email. Written consent to recording was obtained from the clinician and patient just before the review, and confirmed by patients with a second signature afterwards. Patients and clinicians could choose video- or audio-recording. Patients generally had no preference, but most clinicians chose audio-recording, during which the researcher remained in the room to make notes on behaviour and interaction. The dataset included three videos and 25 audio-recordings of GPs and nurses from the eight intervention practices, and four videos and five audio-recordings from the four usual-care practices. Five nurses were recorded more than once. Second, in intervention practices the study conducted a mix of brief opportunistic and longer pre-scheduled post-review interviews with those patients and clinicians who were available, to elicit personal perspectives on individual reviews. Another consent form was signed prior to these interviews. Patients’ individual interviews took place at the practice immediately following the review or a few days later in their home or by telephone for between 10 and 45 minutes. Clinicians were interviewed at the practice for between 5 and 20 minutes. Ten clinician interviews and 10 patient interviews took place in this way. To add to these interview data, other 3D patients in the case study practices were sampled for variety in health status and satisfaction with care at trial baseline, and took part in focus groups or individual interviews according to preference. Invited participants received a letter and information sheet, and were then telephoned to discuss participation. Six patients opted for individual interviews in a place convenient to them and 21 other patients who agreed attended one of four patient focus groups, one in each process evaluation case study practice. Two groups had three participants, one had seven, and the fourth had nine. They met for approximately one hour in a local hall or, in one case, in their practice meeting-room to discuss their experience of 3D reviews and explore divergent opinions. Written consent was provided, and a schedule guided the discussion (schedule available by request from the authors). Furthermore, some clinicians in intervention practices were involved in end-of-trial interviews, arranged by sending an email invitation and conducted at the practice, with written consent provided at the time of interview. In total, 16 patients and 23 clinicians took part in some form of individual interview. In pre-scheduled interviews a topic guide was used (available from the authors on request). The review and interview data are summarised in Table 1. All recordings were professionally transcribed. Each transcript was checked, anonymised, and, for review recordings, annotated with observation notes about body language and actions, including direction of gaze for the video-recordings. Review recordings, clinician interviews, and patient interviews (including focus groups) were initially coded separately with their own framework of codes using NVivo 11. The coding frameworks each combined a priori codes drawn from intervention components and core aspects of patient-centredness (Table 1) and data-derived codes. Box 2 presents the coding framework for the review recordings, showing how codes were combined into the themes reported in this article. The review recordings data were summarised in a matrix organised into nurse and GP reviews, and then divided into intervention and usual care. Each review occupied a row and each theme a column. The cells contained a short summary of each review by theme to facilitate comparison. A matrix was also created for the clinician data and another for patient interview and focus group data. For these data, coded extracts pertaining to patient-centredness and template use were extracted from NVivo, re-coded and summarised under the relevant matrix theme. The matrices were used to compare themes across datasets. Double coding of eight review transcripts was undertaken by two members of a patient public involvement (PPI) group and a further 12 review and interview transcripts were double-coded by three researchers. Three transcripts were also discussed with the whole PPI group. This helped clarify patient-centredness, confirm themes, and identify divergent opinion. Differences in perceptions of patient-centredness were discussed to elucidate reasons. In all quotes in the results, case study practices are referred to by pseudonyms, for example, Beddoes, and other intervention practices by Int1–5. GPs, nurses, and patients are referred to as GP, NU, and Pt, respectively, with a number and a practice identifier. The researcher who undertook the data collection and analysis was previously a nurse and researcher in GP practices. This gave insight into nurses’ conduct of LTC reviews and how practices worked but it was necessary to guard against over-identification with nurse colleagues. Awareness of this helped to maintain objectivity. In both intervention and usual-care observed reviews, computer use that caused loss of eye contact disrupted dialogue. Patients often waited to speak until the clinician had finished data entry or information retrieval. This sometimes seemed an intentional strategy by clinicians, who resumed eye contact to reinforce communication, solicit specific information, or provide instruction. Computer activities caused less disjunction when screen positioning did not require clinicians to turn right away from the patient, and clinicians could switch their attention more easily between patient and computer or share the displayed information. In nurse usual-care reviews, patients more often continued to talk while data was being entered, suggesting that, like the nurses, they were generally relaxed with a familiar process. Some nurses reduced computer use by working from a printed checklist and making handwritten notes to enter later. Usual-care nurse reviews usually began with confirmation that the appointment was to review the patient’s LTC(s). Patients sometimes raised other concerns when initially asked how they were, for example, back pain, but the LTC review took precedence and other concerns may have been closed off or ignored. However, most clinicians highly valued the enquiry about the patient’s agenda and saw it as novel. Some identified unmet health needs through patients revealing previously unmentioned symptoms, leading to new diagnoses, for example, melanoma, heart failure, and hip osteoarthritis. GPs usually began their 3D reviews by referring to the nurse review and patient agenda. Some GPs confirmed its contents with the patient; others preferred to agree an agenda themselves. However, one patient expressed dissatisfaction because their GP lacked knowledge of their rare condition and so had taken their main concern off the agenda. Sometimes concerns were overlooked, for example, a very swollen knee was not addressed because the nurse had described it generically on the agenda as a pain and mobility problem. Some nurses ran through questions quickly in a way that favoured a no problem response. However, one nurse spent 19 minutes completing the depression screening because each question triggered a discussion of the patient’s circumstances, preferences, and feelings. Most usual-care reviews concluded with a verbal management plan, but 3D nurse reviews concluded with creating an agenda for the GP review, leaving nurses no obvious role in agreeing management plans. However, many nurses continued to advise on LTC management and some skilful negotiations were observed with the nurse eliciting and accommodating patient preferences, for example, regarding change of medication, home blood pressure monitoring, and diet. 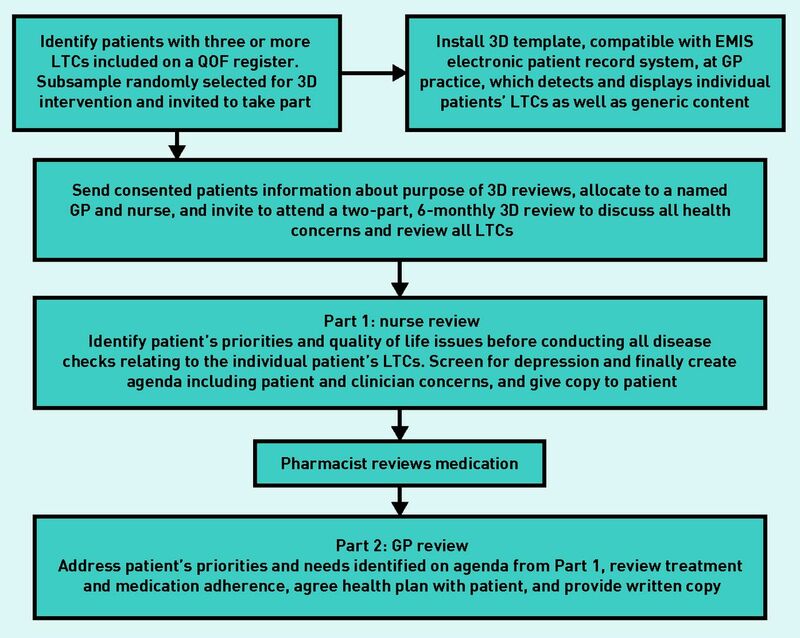 In GP 3D reviews, the template required a health plan, which stated the problems and included actions that the patient and GP could take to address them. Some patients liked having a printed health plan, but many did not remember receiving one. Some GPs felt the way the plan was formulated was patronising and artificial, and they often found difficulties in printing the plan. Many patients were not given or did not remember receiving a printed copy. Boxes 3 and 4 summarise the findings and compare themes across datasets facilitating comparison of usual care and the intervention regarding template use and patient-centredness of nurses and GPs. Usual-care nurse review observations Template structured the reviews but not intrusive as patients and nurses were familiar with it. Usually completed during review Restricted to reason for review. 3D GP review observations Template mostly followed but in a more free-form way than by 3D nurses. Some overtly referred to template when checking review was complete and printing health plan. Data entry less intrusive than in nurse reviews. LTC = long-term condition. PHQ-9 = nine-item Patient Health Questionnaire. PHQ-9 = nine-item Patient Health Questionnaire. Although the 3D template increased disruption to communication compared with usual-care reviews, patients experienced 3D reviews as more patient-centred. The template contributed questions about patients’ most important problems, quality of life, and mood, which uncovered a wide range of patients’ concerns including unmet health needs, and an individualised patient agenda. Whether patients’ agenda items were all subsequently addressed by the GPs depended partly on how nurses framed them and GPs’ skills and priorities, but many clinicians valued hearing about patients’ own concerns and quality of life. Being reviewed as a whole and asked about their health priorities was experienced by patients as more personal than usual care. Other important factors were feeling listened to and experiencing a liberating sense of having time and permission to raise other concerns, in contrast with more constrained usual-care appointments. Some patients described these changes as novel and empowering. The 3D health plans were less successful and less valued by GPs or patients. Plans were often GP-led, rather than patients shaping the management of their health according to goals they had identified. The medicalisation of concerns recorded on the patient’s agenda and skill deficits in enacting genuine shared responsibility in creating and achieving health goals may have contributed. Patients may need time to get used to a new approach and a few patients referred to a lack of meaningful negotiation. It could not be ascertained how much the template alone influenced patient-centredness. Clinicians had had training for the 3D study that covered the challenges facing patients with multimorbidity, eliciting patients’ priorities, and negotiating a shared approach to the patients’ health problems. Observing reviews may have influenced the data as clinicians were very conscious of the observer’s presence and may have changed how they conducted the review. In intervention reviews, clinicians may have felt under scrutiny, perhaps explaining the lower proportion of intervention video-recordings, compared with usual care. Patients seemed generally less aware of the researcher, but some interacted with her during the review. Comparing intervention reviews with usual-care reviews helped to assess the effect of the 3D template but the researchers were unable to meaningfully compare GP 3D reviews with the one GP usual-care review. Instead, the researchers contrasted current practice of LTC reviews conducted by nurses with 3D reviews in which both nurse and GP were involved. Various common consequences of template use described in the literature were observed in the use of the 3D template.7,10,14,20 Positive consequences included providing structure, promoting thoroughness and consistency, facilitating information recording and retrieval, and gauging progress against goals.6,21 Negative consequences included disruption of communication, which was exacerbated by use of the unfamiliar 3D template7,9,14 and routinisation of enquiry, with questions asked to suggest particular or closed answers.11,13 It is possible that adjustments to the template, based on feedback from clinicians, might reduce these consequences. Occasional deliberate use of the computer to close off patient communication, previously observed elsewhere,18 was also noted in the present study. Although template use can detract from patient-centredness by overriding patients’ agendas, and imposing professional priorities,7,13 patients’ increased perception of patient-centredness in this study indicated that the 3D computer template reversed this effect by first prompting clinicians to explore patients’ illness experience. However, as with other templates, there was a danger of conflating template completion with care delivery. Clinicians’ responses suggested that some did equate the template with the intervention and that their underlying patient-centred consultation skills consequently did not change. The health plan findings suggest that more thought needs to be given to its format and use, both in terms of skill and how it might be used with patients coping with deprivation, poor health literacy, and linguistic ability. Further research might usefully identify a more effective way of addressing these intervention issues. The findings of this study suggest that patient-centredness can be influenced by the content of the template, not just by template use alone. A template for reviewing multiple LTCs that explicitly incorporated questions about patient priorities, and asked these first, established a focus on the patient’s perspective. This could help to change clinicians’ behaviour towards a more equal agenda balance and patients’ behaviour towards seeing reviews as an opportunity to take greater ownership of their health. Including an enquiry about patients’ main health concerns as the first question on every LTC review template and building in other patient-centred questions should be considered as a means of supporting a patient-centred approach. Thanks are owed to Ruth Sayers and Judith Brown who double-coded some transcripts, and other members of the PPI group who contributed thoughtful comments and discussion about patient-centredness of reviews. The authors are very grateful to the patients and clinicians who consented to be interviewed and/or have reviews recorded, the practices who consented to take part, and their administrators, who helped identify possible participants for this project. This project was funded by the National Institute for Health Research, Health Services and Delivery Research (NIHR) Programme (project number 12/130/15). The views and opinions expressed herein are those of the authors and do not necessarily reflect those of the above funder, NIHR, NHS, or the Department of Health. The study was approved by South West (Frenchay) NHS Research Ethics Committee (14/SW/0011). Revision requested December 19, 2017. (2001) Towards a global definition of patient centred care. BMJ 322(7284):444–445. (2008) Patient-centered care and adherence: definitions and applications to improve outcomes. J Am Acad Nurse Pract 20(12):600–607. (2002) Patient-centred consultations and outcomes in primary care: a review of the literature. Patient Educ Couns 48(1):51–61. (2011) The values and value of patient-centered care. Ann Fam Med 9(2):100–103. (2013) Effects of exam room EHR use on doctor–patient communication: a systematic literature review. Inform Prim Care 21(1):30–39. (2012) Computer templates in chronic disease management: ethnographic case study in general practice. BMJ Open doi:10.1136/bmjopen-2012-001754. (2012) Interventions for providers to promote a patient-centred approach in clinical consultations. Cochrane Database Syst Rev (12):CD003267. (1995) How do desk-top computers affect the doctor–patient interaction? Fam Pract 12(1):32–36. (2014) Provider interaction with the electronic health record: the effects on patient-centered communication in medical encounters. Patient Educ Couns 96(3):315–319. (2015) Implementing telephone triage in general practice: a process evaluation of a cluster randomised controlled trial. BMC Fam Pract 16:47. (2013) How QOF is shaping primary care review consultations: a longitudinal qualitative study. BMC Fam Pract 14:103. (2006) What does the use of a computerized checklist mean for patient-centered care? The example of a routine diabetes review. Qual Health Res 16(3):353–376. (2010) Consulting room computers and their effect on general practitioner–patient communication. Fam Pract 27(6):644–651. (2014) Beyond the ‘dyad’: a qualitative re-evaluation of the changing clinical consultation. BMJ Open 4(9):e006017. (2016) Improving the management of multimorbidity in general practice: protocol of a cluster randomised controlled trial (the 3D Study). BMJ Open 6(4):e011261. (2016) Protocol for a process evaluation of a cluster randomised controlled trial to improve management of multimorbidity in general practice: the 3D study. BMJ Open 6(5):e011260. (2010) Doctor’s non-verbal communication in consultations: look at the patient before you look at the computer. Br J Gen Pract doi:10.3399/bjgp10X482293. (2016) Sample size in qualitative interview studies: guided by information power. Qual Health Res 26(13):1753–1760. (2016) Patient and public involvement in primary care research — an example of ensuring its sustainability. Res Involv Engagem 2:1. (2006) Systematic review: impact of health information technology on quality, efficiency, and costs of medical care. Ann Intern Med 144(10):742–752.